Brussels-based multimedia journalist and communications specialist. 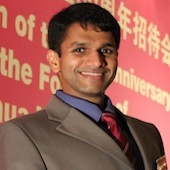 Rahul Venkit is a multimedia journalist and communications specialist from India, currently reporting on Europe for a Chinese news agency. Since 2000, Mr. Venkit has worked in TV, radio, print, web journalism and communications in five countries so far. He is currently with China’s official Xinhua News Agency in their European bureau headquarters in Brussels. Mr. Venkit began his career at age 16 with The Indian Express newspaper in Pune, India. He has since worked for MediaCorp Press in Singapore, the Commonwealth Secretariat in London, China Radio International in Beijing during the 2008 Olympics, and the International Diabetes Federation in Brussels. He has also contributed to the Financial Times and India’s NDTV news channel from China and Europe. Mr. Venkit holds a masters degree in International Broadcast Journalism from the University of Westminster, London, and a bachelors degree in Economics from the University of Pune.